breadstick snails | what is clara eating today? mix the dry ingredients together. mix the wet ingredients together. combine wet mixture and dry mixture. divide the dough into two. 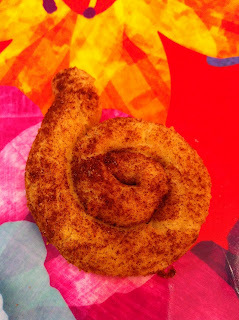 roll out each dough into long rods, and make them into snail shapes. place the snail shapes on a baking sheet. if the dough is too soft to work with, put them in the freezer for 5 minutes. sprinkle splenda and cinnamon on top. bake at 320 for 12 minutes. Hi Tiffany, My daughter’s ratio has dropped significantly over the past couple of months to 2:1 from 3.75:1. I’m excited to try more of your recipes now. I put this one in the calculator and came up with a 1.35:1 ratio. The significant thing lowering the ratio was the coconut flour. I use Bob’s Red Mill. Do you think the coconut flour brand is the reason for the ratio calculation discrepancy?